Newspaper article in the The Sanford Herald on Harry M. Papworth's re-election to the Sanford State Farmers' Market Advisory Board in 1939. Papworth was a major figure in the success of the farmers market. The Sanford State Farmers' Market, located at 1300 South French Avenue, was founded in 1934 in order to provide a central location in which farmers would sell their produce directly to consumers. The idea for the Sanford State Farmers' Market was devised by Fred Dorner and Gus Schmach, both members of the Seminole Agricultural Club. Sanford Chamber of Commerce president Harry Papworth also contributed to the development of the market. The Federal Emergency Relief Administration (FERA) authorized construction plans on June 11, 1934. On June 20, 1934, the City of Sanford donated a portion of the Alex V. French properties to the State Marketing Board, which selected the northwest corner of French Avenue and Thirteenth Street. The board approved the installation of telegraph and telephone equipment, as well as a three-pump filling station. The Sanford State Farmer's Market opened on December 18, 1934. By 1939, the Farmers' Market was bringing a total volume of business of $627,065.81. In 1941, business volume reached over $700,000. On April 4, 1957, a fire destroyed the building and caused damages estimated at $2.5 million. Reconstruction began almost immediately and the Farmers' Market was expected to re-open by the fall of 1957. In 1991, plans were created to restore, preserve, and convert the citrus packing house into a museum. Photocopy of original newspaper article: "Papworth Again Named to Head Market's Board: Two are Re-Elected to Advisory Body, Lehman Reports." The Sanford Herald: State Farmers' Market Collection, Museum of Seminole County History, Sanford, Florida. Original newspaper article: "Papworth Again Named to Head Market's Board: Two are Re-Elected to Advisory Body, Lehman Reports." The Sanford Herald. Digital reproduction of photocopied newspaper article: "Papworth Again Named to Head Market's Board: Two are Re-Elected to Advisory Body, Lehman Reports." The Sanford Herald. H. M. Papworth, who has served as chairman of the advisory board of the Sanford State Farmers' Market since its organization with the exception of one year, was unanimously re-elected to head the board for the coming year at a meeting held at the market last night, H. J. Lehman, manager, reported today. Mr. Papworth was introduced at the State market convention in Jacksonville last week as the oldest and first chairman of any advisory committee in the State marketing system. The chairman has served the Sanford market, oldest in the state, continuously except for the 1939, when John Meisch, Sr. ,was head of the advisory group. W. A. Leffler and Gus Schmach, whose term of office had expired, were re-elected members of the advisory committee. Committee members approved a request of Harry Tooke for coloring rooms and ventilators in the citrus packing house at the market, providing the cost did not exceed $400. 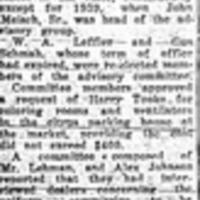 A committee composed of Mr. Lehman, and Alex Johnson reported that they had interviewed dealers concerning the uniform commission to be charged for buying and handling produce on consignment. Dealers said they would call a meeting of all those who expect to operate at the market next season and agree upon a uniform rate and would give a report of their agreement to the advisory committee for consideration and approval. It was decided that "buyers' cards" would be printed on stiff cardboard advertising the market on one side and having [illegible] and linen for the convenience[?] of the trucker to list articles bought on the reverse side. These cards will be given to truckers as they enter the market. Mr. Lehman reported that the roof of the market restaurant needed repairing, and that the rain would ruin the building[?] unless it were fixed. The manager was instructed to take steps to report[? [ the roof. A report of[?] the market meeting in Jacksonville was given by Mr. Papworth. A[?] law approved by the recent legislature is [illegible] and [illegible] dealers and [illegible] dealers and truckers was [illegible] by board members. “Papworth Again Named to Head Market's Board: Two are Re-Elected to Advisory Body, Lehman Reports.” RICHES of Central Florida accessed April 26, 2019, https://richesmi.cah.ucf.edu/omeka/items/show/1163.